In the immediate aftermath of the 1513 battle fought at Branxton, there can be little doubt that successful soldiers, in the manner of soldiers of every age, and local people, collected souvenirs from the battlefield. Although some such items have survived, over the centuries it is not easy to reliably attribute pieces, even of that period, as coming from the battlefield. As time passed, however, other battles and events attracted interest, and the Battle at Branxton, despite its high cost in human life and its major impact on the Kingdom of the Scots, sank into partial obscurity. It was not until the 19th century, that there was a major revival of interest in this Battle. Stout heart, and open hand! Thou flower of English land! The hand of such as Marmion clasp. He did however allow Marmion to leave with his men for Flodden, under the King’s safe conduct. There he was welcomed by the English. In the battle that followed, Marmion fought bravely but, was mortally wounded. De Wilton fought with distinction, reclaimed his lands and the hand of Clara. The popularity of the story and the wonderful descriptions of the Border scenery reawakened interest in the Battle, and in surrounding sights including Holy Island and Norham Castle. A further fillip was given by the evocative paintings produced by J.M.Turner, who produced a succession of pictures of Norham Castle as well as views of Bamburgh, Dunstanburgh and Alnwick Castles and of Holy Island. By the middle of the century, the Border area became, by the standards of the day, a tourist destination, particularly after the opening of the railways to Edinburgh and Kelso. In August 1867, one of those tourists was the widowed Queen Victoria who visited the Borders, on her way to Balmoral. It was the first such public visit she had made since Prince Albert died, six years earlier. The Royal party travelled by overnight train from Windsor, arriving at Kelso in the late morning of Wednesday 21 August. There they were met by the Duke and Duchess of Roxburgh, their hosts for the next three days, and the Duke of Buccleuch with others. They drove to Floors Castle through the town, decorated for the occasion; flowers were thrown in front of the carriages, and the Queen presented with what she described as an enormous bouquet. That evening, from the library of the Castle, they watched the illuminations and bonfires organised for the occasion. The next two days were spent largely in following in Walter Scott’s footsteps. There were visits to Melrose Abbey on the Thursday and Jedburgh on the Friday, both featuring in Scott’s verse. On the Thursday, the Queen also went to Abbotsford, where she saw Sir Walter’s rooms, manuscripts of some of his books, and his collection of historic artefacts. Friday brought the Royal visit to an end, and, at 11pm, the Royal party left Floors to take an overnight train journey to Balmoral. Once again the Kelso streets were crowded, and the whole route illuminated. The Queen wrote: I had been most kindly received, and had been very comfortable, and enjoyed all I saw, and felt much all the kindness of high and low. Among the souvenirs of her visit, Queen Victoria took with her a copy of Sir Walter Scott’s Marmion. How she came to receive it was described in an article in the Berwick Advertiser, published 31 August 1867. Queen Victoria’s ‘Marmion’During Her Majesty’s sojourn at Floors Castle, Messrs A. & R. Robb had the honour of presenting to her Majesty, through Her Grace the Duchess of Roxburgh, a large and handsome edition of Sir Walter Scott’s ‘Marmion - a tale of Flodden Field,’ illustrated with fifteen full-page photographs, and bound in an elegant style. The boards were made of wood grown on Flodden Field, and embellished with finely engraved views of the Border Castles (mentioned in the Poem) and surrounded with ornamental borders and corners. The design of the binding and ornament ;was particularly chaste and appropriate. Her Grace intimated to Messrs Robb that the Queen was graciously pleased to accept of the Work forwarded to her for presentation, and that Her Majesty is much obliged to them for their loyal attention, and for preparing such a handsome present for the Queen’s acceptance. This copy of Marmion still survives in the Royal collection, and in 2013 we were fortunate to be able to borrow it for an Exhibition at Coldstream Museum ‘Fit for a Queen’ which commemorated this event. As can be seen, the book is exactly as described, save that the newspaper account makes no mention of the Queen’s monogram which has pride of place on the front cover. 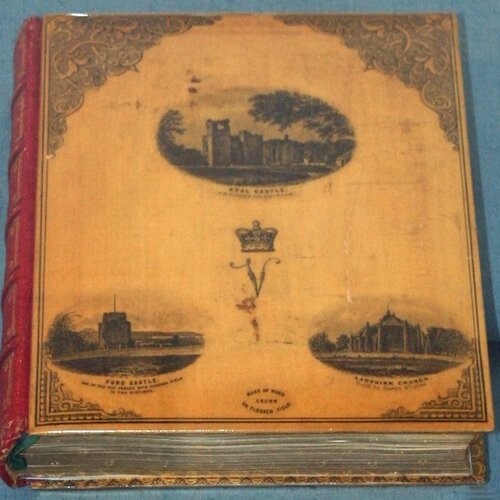 The binding of the book, sycamore wooden boards decorated with attractive cartouches, in this instance of Etal Castle, Ford Castle and Ladykirk Church on the front, and Twizel Castle, Norham Castle and a different view of Ford Castle on the back, is generally described as being of Mauchline Ware, after the small Ayrshire town where such decorative sycamore items were manufactured. The manufacturers (as opposed to retailers) of these items were the firm of W. & A. Smith. The Smiths originally went into business as manufacturer of snuff boxes and razor strops in the 1820s, but were quick to appreciate the tourist potential for souvenirs. Their first forays into this field consisted of a variety of wooden items - boxes, card cases, bracelets, paper knives decorated with hand painted scenes, often against a tartan background. Such items, however, though appropriate for the upper classes, were much too expensive to produce to be appropriate for the growing numbers of ordinary citizens, who were starting to take advantage of railway day excursions to visit places they had heard about. It was the Smiths’ genius, about 1850, to recognise the need for a cheaper type of souvenir and to find a more cost effective way of manufacturing them. These pieces, commonly called transfer ware, were made from sycamore wood. Steel or copper plates were engraved with the transfer scenes, several to a plate. These were then printed on to fine silk paper. When an item was ready to be decorated, it was painted with a thin layer of shellac varnish, to which the paper transfer was applied, ink side down, while the varnish was still damp. Once the item was dry, the paper was rubbed away with a wet cloth, leaving the ink trapped in the varnish. Up to a dozen more layers of varnish were then applied, each rubbed down with very fine sandpaper, before the next was put on. It is said that the varnishing was done by the workers’ children sitting on the cottage steps. After that, the piece was given a final polish and a touch of olive oil before being ready for dispatch. This process produced affordable souvenirs for buildings of note, holiday resorts, cities - most notable Glasgow and Edinburgh - and a range of items linked to men of letters such as Robert Burns and Walter Scott. Perhaps not surprisingly, initially there was some Scottish bias to their production, but their items were found in all corners of Britain (Eastbourne actually holds the record for the largest number of transfers of one place! ), and were exported with appropriate transfers to Europe, the U.S.A. as well as South Africa, Australia and New Zealand. As a variation on the theme, in the 1860s, the company also began to produce items made of what they described as Relic Wood - wood salvaged from a building of particular interest, or cut from trees growing in a significant spot. It was this aspect of the market which the Robb brothers (Messrs. Robb) tapped into, when they arranged with Smiths to produce items labelled MADE OF WOOD GROWN ON FLODDEN FIELD. Advert from Rutherfurd’s Southern Countries Register and Directory 1866The Robb brothers came from Coldstream and were sons of John Robb, an Army shoemaker. The elder, Andrew began work with his father, but moved on after John’s death in 1855. He seems to have had an entrepreneurial streak. The 1861 census shows him as a Collector of Accounts, Librarian and Post Messenger. He also contributed to community life as a Sunday School Superintendent, a Trustee of the Mechanics’ Institute, Librarian of the Reading Room and Secretary of the Border Horticulturists’ Show. Robert, 11 years younger, was apprenticed to Carmichael’s, the Coldstream grocer, and was recorded as a grocer’s assistant in 1861. The brothers opened a joint Grocer’s and Bookseller’s shop in Coldstream High Street in 1862. They probably began selling Flodden Field Wood Work in 1864, the date shown on some of the transfers. That Christmas, they advertised some 50 different articles. In June 1865, they took over the adjacent shop, and added two new transfers to their range. By 1866, they had an exclusive stock of over 60 items. This then was the context, when they commissioned Smiths to produce the special volume for Queen Victoria, a known enthusiast for the works of Sir Walter Scott. Subsequently the Robbs used the newspaper report quoted above to further advertise their wares. In 1869, they paid £700 to acquire yet more property. Then they began supplying other retailers – Brands of Wooler were selling Flodden Wood items in 1871. The business continued to flourish until 1874. Then some difficulty must have arisen between the brothers. Robert sold his share of the business to Andrew for £100, dissolved the partnership and set up his own grocer’s shop in Lowick, some 10 miles away. The next year, Andrew became ill and eventually died from heart disease on 5 September 1877. The firm continued under Andrew’s nephew, John Smith, but the ‘glory days’ of Robbs’ Flodden Field Wood Work were over. It was one thing to advertise ‘MADE OF WOOD GROWN ON FLODDEN FIELD’, but where and how did the Robbs obtain it? In the 1860s, the battlefield was part of the Ford Estate, then owned by Louisa, Lady Waterford. One of the great beauties of her day, and daughter of the British Ambassador, Sir Charles Stuart, Louisa was born in 1818, and, in 1842, married Henry, Marquis of Waterford and moved to Ireland. When a fall from his horse killed Henry in 1859, Louisa inherited the Ford Castle Estate from him, and spent much of the rest of her life developing and improving the village. the erection of a memorial fountain to her late husband. Sadly no records have been traced to show that the Robbs did obtain their wood from the Ford Estate and Lady Waterford. Nevertheless, beyond Lady Waterford’s enthusiasm for all things Flodden, there is circumstantial evidence to suggest that she played an active part in the enterprise. Among the transfers regularly used on Flodden souvenir pieces are those of the restored Ford Castle, of the Tower where she refurnished the King’s bedroom, of the village school and of the memorial fountain, the latter two, in particular, bearing no Flodden associations, but of significant importance to Lady Waterford herself. We also know that Lady Waterford used Flodden souvenir ware as personal gifts, for example presenting her god-daughter, Anne Gledstanes Fairholme with an unusual music manuscript book with Flodden wood covers. Arguably the Flodden Wood souvenirs owe as much to Lady Waterford’s enthusiasm as to the Robbs’ enterprise - perhaps, as with Robert Jones’ book, she even suggested the idea. So what were these items sold as souvenirs of the Battlefield? As noted above the Robbs advertised sixty different items, and for the Exhibition, we succeeded in bringing together some fifty examples of the items they sold. The full list can be seen in the advertisement. Items ranged from bookmarks and napkin rings, through a range of sewing necessaries - thimble cases, needle cases of several types, thread boxes, reel stands and work boxes. There were wool balls, vesta cases, spill vases, egg cups, tea caddies, a wide range of books (including Jones’ History of Flodden), photograph albums, letter racks, lantern slide boxes, ink wells, blotters, stamp boxes and stationery boxes. Unlike many of today’s souvenirs, these were items which were of real use to the recipient. Although all the Robbs’ items carried the MADE OF WOOD GROWN ON FLODDEN FIELD legend, the transfers with which the pieces were decorated, were more wide ranging. Certainly a number had views which directly related to the Flodden campaign - FORD CASTLE; FORD CASTLE - ONE OF THE OLD TOWERS WITH FLODDEN FIELD IN THE DISTANCE; ETAL CASTLE; NORHAM CASTLE; TWISEL BRIDGE OVER WHICH SURREY’S VANGUARD PASSED ON THE DAY OF THE BATTLE OF FLODDEN; LADYKIRK CHURCH BUILT BY JAMES 4TH, 1500; and COLDSTREAM BRIDGE. Less directly relevant were views of THE HIRSEL, the Douglas-Home house, although the Homes did play a significant role at the Battle, and PALLINSBURN, another important house in the area - here while the house had no place in the story, the burn after which it was named was key to the English reaching their battle positions undetected. Others, though local scenes of interest, had no connection to the Battle. These included the other transfers of Ford mentioned above - THE FOUNTAIN; and FORD SCHOOL HOUSE, TWISEL CASTLE, an 18th century folly; TWISEL BRIDGE AND CASTLE; and, at Coldstream, the MARJORIBANKS MONUMENT and the MECHANICS INSTITUTE - was this latter perhaps a special fund raising initiative on Andrew Robb’s part for an organisation with which he was involved? Certainly far fewer items with this transfer seem to survive than with the others. ‘WARRANTED MADE OF OAK FROM THE GREY FRIARS OR EAST CHURCH OF STIRLING BUILT, BY JAMES IV, THE HERO OF FLODDEN, AD 1494’. ‘Hero of Flodden’ does not suggest a good understanding of the Battle and its outcome, but that it was souvenir worthy was surely understood!